Through its B-TAP program, the City contracts with local non-profit organizations focused on entrepreneur training to provide direct services, including accounting, business planning, and compliance consulting. New and existing Minneapolis businesses interested in receiving services can contact the service provider of their choice directly or contact B-TAP staff for more information at (612) 673-5095 or btap@minneapolismn.gov. The frequently asked questions document, available in the Download Center (to the right), provides information on implementation and enforcement. It communicates how the Minneapolis Department of Civil Rights may guide its personnel in interpreting the Minneapolis Sick and Safe Time Ordinance. It was last revised September 2017. The rules, available in the Download Center (to the right), govern the procedure that the Minneapolis Department of Civil Rights will follow to enforce the ordinance. Do you have employees that work within Minneapolis City Limits? Does your current paid time off plan meet the requirements of the City of Minneapolis Sick and Safe Time Ordinance? To learn more view or print the Employer Checklist in the Download Center (to the right). This tool can help you identify an employee's leave balance using the accrual method of 1 hour earned per 30 hours worked. Leave balance will update automatically on this spreadsheet if the number of hours used is entered accurately. The Sick and Safe Time Ordinance required notice poster must be displayed where employees can easily read it in any/all languages needed by 5% or more of employees. Download the poster in the Download Center (to the right). The selection of frequently asked questions (below) address many practical concerns. To view the answer to the question, click the "+" symbol and a drop down will appear. Accrual describes how something increases. As time passes and an employee works more and accrues more sick and safe time hours. When does an employee begin to accrue sick and safe time? ​After the ordinance takes effect on July 1, 2017, an employee begins to accrue sick and safe time hours whenever she starts working. Although an employee accrues sick and safe time beginning on the first day of work, an employer may record those sick and safe time hours per pay period and prohibit the employee from using sick and safe time during an initial 90 calendar days of employment. The minimum rate at which an employee accrues sick and safe time is one hour for every 30 hours worked. Julian has worked 120 hours. How many sick and safe time hours has he accrued? Julian has accrued four sick and safe time hours. After 150 hours worked, he will accrue a fifth sick and safe time hour. ​record sick and safe time hours? ​Employers may calculate and record sick and safe time hours at the same frequency as the employer’s other typical payroll practices (e.g. per pay period, weekly, bi-weekly, twice-per-month etc. ), as long as it is recorded at least once per month. Do employees accrue sick and safe time in hour-unit increments? ​Yes. Sick and safe time accrues in increments of whole hours, not fractions of an hour. Upon completion of every 30 hours worked, an employee accrues at least one additional hour of sick and safe time. Employers may exceed this minimum standard by recording time in fractions of an hour if they choose. Employee Aamina has worked 80 hours. How many hours of sick and safe time has she accrued? She has accrued at least two sick and safe time hours. Her employer may choose to record additional time in fractions of an hour. If Aamina continues, at the end of 1440 hours worked in Minneapolis, she has accrued at least 48 (1440/30) hours of sick and safe time, recorded at least monthly. ​is NOT WORKING (E.G. on vacation or out sick)? ​No. Sick and safe time does not accrue when an employee is not working. ​When an employee is compensated based on her productivity, his/her accrual of sick leave is measured by the actual length of time spent performing work. Exempt employees (employees who are exempt from overtime pay requirements under the federal and Minnesota wage-hour laws) are presumed to work 40 hours per week for the purposes of sick and safe time accrual. In instances where there is clear evidence that an exempt employee’s regular work week is less than 40 hours, sick and safe time accrues based upon that employee’s actual regular work week. Employees who are exempt from overtime requirements are generally those employees who are paid on a salaried basis and qualify as supervisors, administrative or professional employees. For more information visit http://www.dli.mn.gov/ls/OtExempt.asp and https://www.dol.gov/compliance/guide/minwage.htm. ​For an employee who is not exempt from earning overtime compensation under federal and Minnesota wage-hour law, sick and safe time hours accrue on all hours worked, including overtime hours worked. When is an employee covered by the Sick and Safe Time Ordinance? ​Employees who typically work at least 80 hours in a benefit year within the geographical boundaries of Minneapolis are covered under the Sick and Safe Time Ordinance. Employees who only drive through the city are not covered even though this occurs during an employee’s work hours. An employee accrues sick and safe time hours only while physically located within Minneapolis and performing work for the employer. ​NOTE: In a lawsuit brought against the City of Minneapolis in the case of Minnesota Chamber of Commerce et al v. City of Minneapolis, Court File No. 27-cv-16-15051, the Hennepin County District Court issued an injunction prohibiting the City of Minneapolis from enforcing the Sick and Safe Time Ordinance against any “employer resident outside the geographic boundaries of the City.” This case is currently on appeal to the Minnesota Court of Appeals. As a consequence, the Ordinance will not be enforced against any employer resident outside the City of Minneapolis pending a decision by the Court of Appeals. Does an employee lose accrued and unused sick and safe time hours at the end of the benefit year? No. Accrued and unused hours of sick and safe time do not expire at the end of the benefit year (unless an employer chooses to front-load sick and safe time hours). ​An employee’s accrued and unused sick and safe time hours is the employee’s “bank”. Yes, employers must “carry-over” each employee’s accrued and unused sick and safe time hours to the following benefit year (unless an employer chooses to front-load sick and safe time hours). What does “benefit year” mean? Whichever method an employer chooses to measure the benefit year, once established it must be communicated to employees and applied similarly for all employees. A consistent measuring period from year to year and from employee to employee is required. Is there a “cap” on how many sick and safe time hours an employee can accrue? Yes. Employers may set a “cap” or “limit” on each employee’s accrual. Employers must allow each employee to accrue at least 48 hours per year, carried over from year to year, until an 80 hour maximum accrual cap is reached. These two limits operate in tandem. These limits of 48 hours per benefit year and a maximum accrual cap of 80 hours per employee may be higher if an employer chooses, but not lower. Lyndale Consultants limits its employees’ accrual of sick and safe time at the minimum standard of 80 hours. Anthony accrued 30 sick and safe time hours by the end of the first benefit year of his employment. These 30 hours carried over into the second benefit year, during which he accrued an additional 48 hours. What happens during the third benefit year? Anthony accrues an additional two sick and safe time hours (30 hours + 48 hours + 2 hours) before stopping at a limit of 80 hours. ​He must use some accrued hours in his “bank” of 80 hours before accruing more sick and safe time. ​(if an employer has set one), does he receive credit for additional hours worked? No. Once an employee reaches the yearly cap of 48 hours, he no longer accrues sick and safe time hours for that benefit year. Once an employee reaches 80 hours through carry-over and accrual, he no longer accrues additional hours (even if the yearly cap is not yet met) until he uses some of the hours he has "in the bank.” These two limits, 48 hours per benefit year and a maximum accrual cap of 80 hours, operate in tandem. The limits may be higher if an employer chooses, but not lower. Employee Anthony reached his overall accrual cap of 80 hours. Later, Anthony uses eight hours, reducing his accrual to 72 (80 – 8). Upon his return to work, he begins accruing again. Following an additional 240 hours worked (240/30 = 8), he replenished his accrual of 80 hours (72 +8). Does the Sick and Safe Time Ordinance require employers to provide 48 hours of sick and safe time to every employee, every year? Not necessarily. An employee accrues the equivalent of at least one hour of sick and safe time for every 30 hours worked. The minimum required number of hours of sick and safe time that an employee accrues depends upon how many hours she works and whether she has reached employer-set limits of 48 hours per benefit year or 80 hours overall, including accrual and carryover. These two limits operate in tandem. May employers who use a January through December benefit year prorate the accrual cap for July 1, 2017 through December 31, 2017? ​Yes, because the ordinance takes effect mid-year 2017, employers may cap accrual for July 2017 through December 2017 at 24 hours. Employers must carryover each employee’s accrued and unused sick and safe time hours into 2018. If from January 2017 through June 2017, an employee accrued sick and safe time hours (i.e. a type of leave that can be used for all sick and safe time purposes, e.g. sick leave, vacation, or PTO etc. ), the employer may count that towards accrual for purposes of compliance for an entire benefit year 2017. 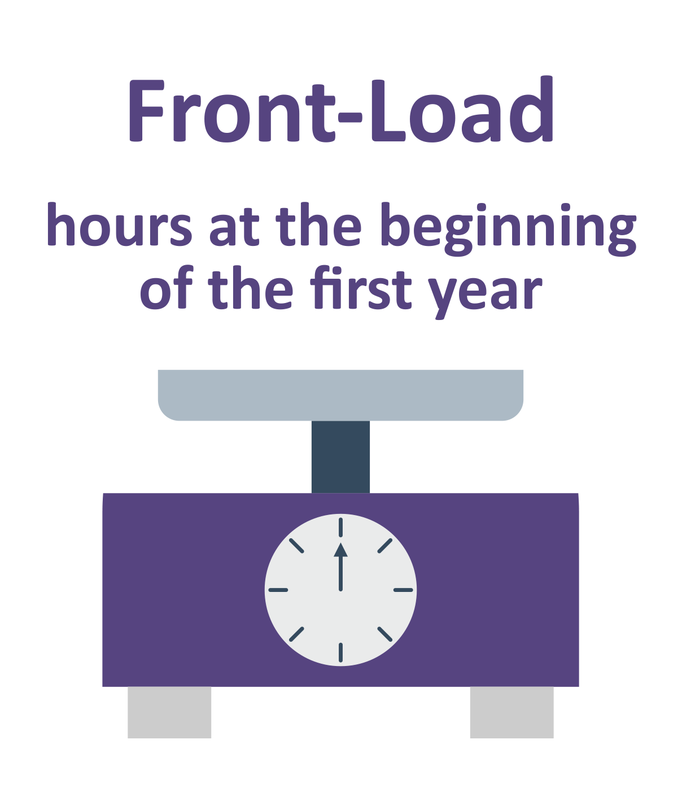 For employers who choose this option, how many hours must be “front-loaded”? An employer who chooses this option must front-load at least 48 hours for use during the employee’s first benefit year. This amount may be prorated if an employee starts at a time when the benefit year is already in progress. This includes all employees employed as of July 1, 2017 (e.g. July 1 through December 31 would be prorated at 24 hours). At the beginning of each subsequent benefit year, an employer must front-load the employee at least 80 hours to fulfill accrual and carryover requirements. If from January 2017 through June 2017, an employee was front-loaded sick and safe time hours – i.e. a type of leave that can be used for all sick and safe time purposes, e.g. sick leave, vacation, or PTO etc. – the employer may count that towards accrual for purposes of compliance for an entire benefit year 2017. Alternatively, employers may carryover any unused hours into subsequent years (subject to an 80 hour overall cap) and provide sick and safe time hours in advance of hours worked (e.g. 48 at the beginning of each benefit year). See #25 and #26 below for more information. Mumtaz is a business owner. She employs Sara and front-loads Sara’s Sick and Safe Time hours once per year. At the beginning of Sara’s first benefit year of employment, Mumtaz front-loaded 48 hours into Sara’s accrual. At the beginning of Sara’s second benefit year and every year thereafter, Mumtaz front-loaded 80 hours into Sara’s accrual. Has Mumtaz complied with the accrual and carryover requirements of the Sick and Safe Time Ordinance? Yes. Must she provide additional hours? No. May employers credit sick and safe time hours for employees on a weekly, monthly, or quarterly basis etc. ahead of hours worked? Yes, nothing in the Sick and Safe Time Ordinance prevents employers from allowing employees to access sick and safe time hours in advance of hours worked. Employers may calculate and credit accrual ahead of hours worked. However, employers must also ensure that a sufficient number of hours are given. Failure to credit enough hours in advance (at least one hour per 30 hours worked, up to yearly and overall caps of at least 48 and 80 hours) must be remedied within one month. Full-time (80 hour per week) employee Aamina has completed 1440 hours worked in Minneapolis. Aamina has thus accrued at least 48 (1440/30) hours of sick and safe time, recorded at least monthly. May Aamina’s employer have awarded sick and safe time in whole hour increments in advance of hours worked? Yes. Aamina’s employer may have chosen to record six hours per month for eight months or three hours bi-weekly (or twice-per-month) for eight months until reaching a yearly limit of 48 hours. ​May an employer treat part-time and full-time employees differently, for example, front loading sick and safe time for some but not others? Is there a period of time allowed at the beginning of employment when an employee may not use sick and safe time? Yes, although an employee begins to accrue sick and safe time immediately, an employer may enforce a 90 day period before allowing an employee to use any accrued sick and safe time hours. Following the first 90 calendar days of employment, an employee must be allowed to access sick and safe time as it is recorded. These 90 calendar days of employment may be completed prior to July 1, 2017. Employee Alicia’s first day of work was Aug. 10. At that time, all of her hours worked must count for the purposes of sick and safe time accrual (i.e. her bank begins to grow immediately). When could she begin to use this sick and safe time? Her employer may require her to wait 90 days, until Nov. 8. As of July 1, 2017, employee Anthony has been employed by the same employer for several years. Must Anthony wait 90 days to use sick and safe time? No, as of July 1, 2017, Anthony has already completed 90 calendar days of employment. An employee may use her accrued sick and safe time hours to care for her own health or the health of a family member or member of household, or to address issues caused by domestic violence, sexual harassment, or stalking. If you would like to read the complete Sick and Safe Time FAQs, please download the file in the Download Center to the right. Do you already offer benefits? ​of each subsequent benefit year fulfills accrual and carryover requirements. ​subscriber preferences, please click the link below.